"A fireplace has always been in the heart of a home. 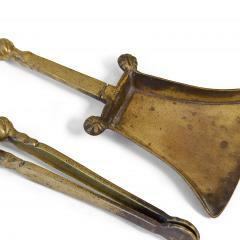 The metals that would adorn these hearths would be durable and often attractive. Borrowing from the styles of their times, they would take on architecture elements like finials, claw-and-ball feet and balluster turnings. If you do not see any items that would interest you, please email or give us a call. We may not have had an opportunity to catalog it yet." 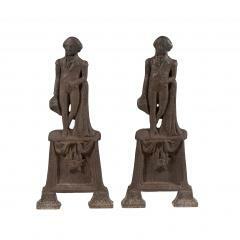 A popular form in the mid nineteenth century, these andirons nicely portray a standing posed Washington above draped medals with removable supports. 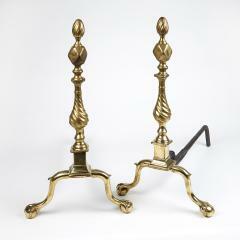 Pair of andirons with diamond-and-flame finials, bulbous shafts and cabriole legs terminating in two-piece ball-and-claw feet. 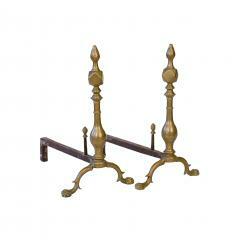 This unsigned pair of brass andirons makes a bold statement. The ball finials, faceted shafts and prominent ball feet are typical of the early nineteenth century. 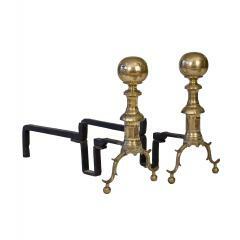 However, these andirons also have scalloped plinths. This design is reminiscent of the late eighteenth century. 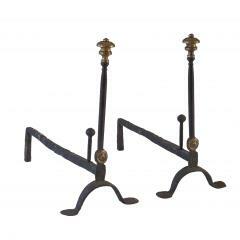 Shovel and tongs with trefoil hooks and twisted knops. Pair is pictured in “New England Begins,” page 286, plate 281.